Jake: There are 15 tiers of a relationship. Right now you're at tier 1, which is hugging. But pretty soon you'd make it to tier 2, which is smooching. Then down the road you'd make it to tier 5, where she'd let you discover all 15 feet of her long beautiful stomach. After a while you'd make it to tier 8, where you touch her horn for the very 1st time, very special. Jake: YOU STAY AWAY FROM THAT! I figure that being a magical stretchy dog dating a flying rainicorn means that cuddling is a pretty awesome tier! 15 feet of long beautiful stomach, indeed. Original is about 12"x18". 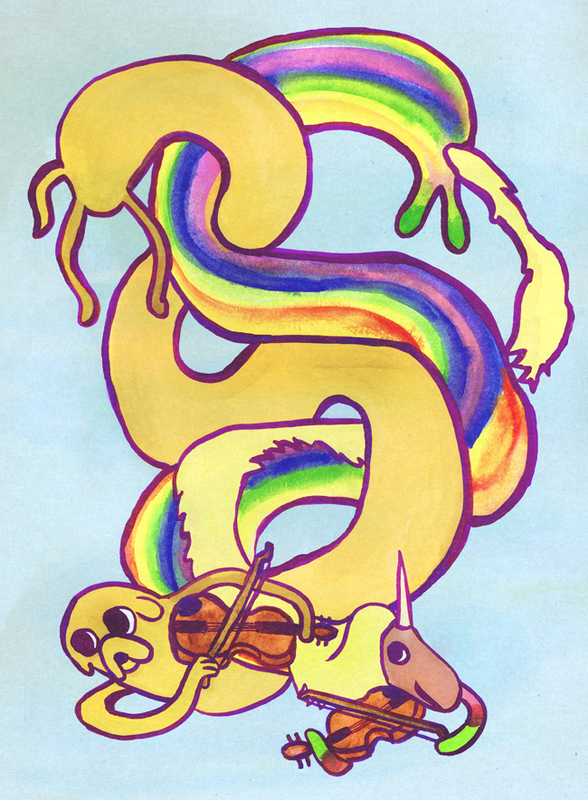 Lady is mostly watercolor, as are the violas, while Jake is pretty much all gouache. Will soon be available as a print and card in my Etsy shop, but that will have to wait until I'm feeling a bit better!